Authors: Russell A. Mittermeier, William R. Konstant, Frank Hawkins, Edward E. Louis, and Olivier Langrand. Foreword by: Peter A. Seligmann and Russell A. Mittermeier. Additional Contributors: Jonah Ratsimbazafy, Rodin Rasoloarison, J�rg U. Ganzhorn, Serge Rajaobelina, Ian Tattersall, and David M. Meyers. One of the three most diverse primate faunas on Earth, and certainly the most unusual. Five families, 15 genera, and 71 distinct taxa, all of them endemic to the island of Madagascar. Not only is Madagascar incredibly important for primates, it is also one of the world's highest priority biodiversity hotspots. It has already lost more than 90% of its original natural vegetation, and it has the highest levels of endemism at the species, genus, and family levels of any hotspot on Earth, conserving not just unique species, but entire evolutionary lineages. 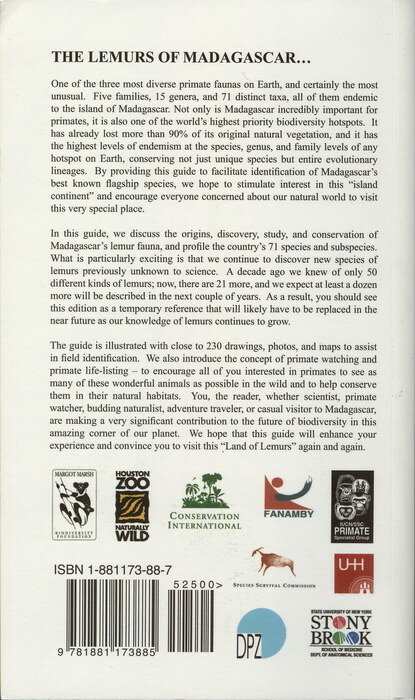 By providing this guide to facilitate identification of Madagascar's best known flagship species, we hope to stimulate interest in this "island continent" and encourage everyone concerned about our natural world to visit this very special place. In this guide, we discuss the origins, discovery, study, and conservation of Madagascar's lemur fauna, and profile the country's 71 species and subspecies. What is particularly exciting is that we continue to discover new species of lemurs previously unknown to science. 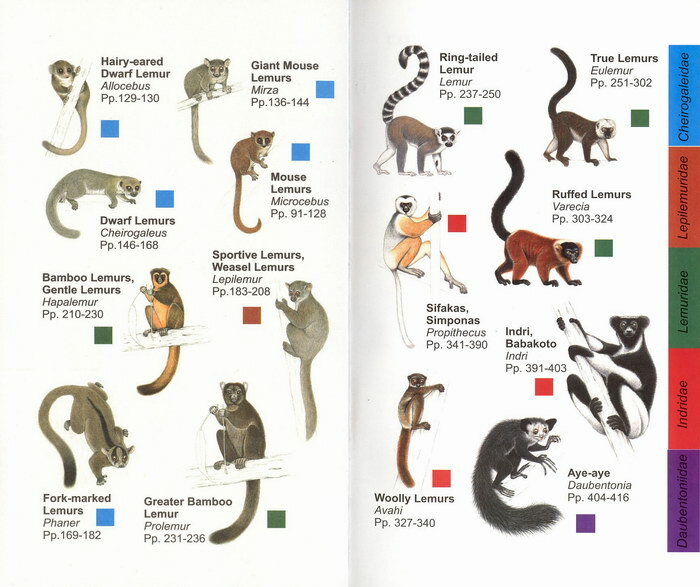 A decade ago we knew of only 50 different kinds of lemurs; now there are 21 more, and we expect at least a dozen more will be described in the next couple of years. 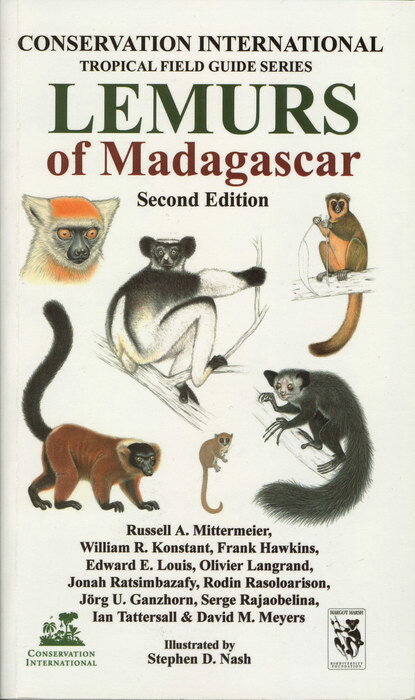 As a result, you should see this edition as a temporary reference that will likely have to be replaced in the near future as our knowledge of lemurs continues to grow. This guide is illustrated with close to 230 drawings, photos, and maps to assist in field identification. We also introduce the concept of primate watching and primate life-listing to encourage all of you interested in primates to see as many of these wonderful animals as possible in the wild and to help conserve them in their natural habitats. You, the reader, whether scientist, primate-watcher, budding naturalist, adventure traveler, or casual visitor to Madagascar, are making a very significant contribution to the future of biodiversity in this amazing corner of our planet. We hope that this guide will enhance your experience and convince you to visit this "Land of Lemurs" again and again. Russell A. Mittermeier is president of Conservation International (CI), and has also served as Chairman of the Primate Specialist Group of the World Conservation Union's Species Survival Commission (IUCN/SSC) since 1977. Prior to joining CI in 1989, he was Vice-President for Science at World Wildlife Fund-US. A primatologist and herpetologist by training, Dr. Mittermeier's publications include 15 books and over 400 articles and he has conducted fieldwork on three continents and in more than 20 countries. He received his Ph.D. in Biological Anthropology from Harvard University in 1977. Bill Konstant is a graduate of Cornell University and currently serves as Director of Conservation and Science for the Houston Zoo. He has more than two decades of experience developing species conservation projects in the Neotropics, Africa, Madagascar, and Southeast Asia. He has held positions with the World Wildlife Fund-US Wildlife Preservation Trust International, the Philadelphia Zoo, and Conservation International, and currently serves on the IUCN/SSC Primate Specialist Group. Frank Hawkins is the Technical Director for Conservation International in Madagascar, and has lived there for more than 15 years. Since completing his Ph.D. on the birds of western Madagascar, Frank has conducted research all over the island on birds, primates, and carnivores, and has published many scientific papers, articles, and books. Ed Louis is the conservation geneticist for Omaha's Henry Doorly Zoo's Center for Conservation and Research. In an effort to develop baseline molecular, distribution, and census data on lemurs and other Madagascar fauna and flora, Louis has carried out and supervised extensive fieldwork on the island since 1998. He received his DVM and Ph.D. in Genetics from Texas A&M University in 1994 and 1996, respectively. Olivier Langrand is Senior Vice President for Africa and Madagascar at Conservation International. He holds a master of science in zoology from the University of Natal and has 20 years of experience in the design and implementation of field research and tropical forest conservation programs. He is also an expert on the birds of the southwestern Indian Ocean islands and the author of more than 80 scientific papers and four books on the biodiversity of the Africa and Madagascar region. Olivier was awarded the Order of National Merit in 1997 by the President of Madagascar for his outstanding contributions to biodiversity conservation. Jonah Ratsimbazafy received his Ph.D. in Physical Anthropology from the State University of New York at Stony Brook in 2002, based on a study of black-and-white ruffed lemurs in Madagascar's Manombo forests. Jonah is presently the Scientific Coordinator for the Durrell Wildlife Conservation Trust Madagascar Program and an Adjunct Associate Professor in the Department of Paleontology and Anthropology at the University of Antananarivo. Rodin Rasoloarison obtained his Ph.D. from the University of Antananarivo in 2000 for his taxonomic revision of Madagascar's mouse lemurs, genus Microcebus. He has since continued to study the taxonomy and biogeography of cheirogaleids in the field as well as in museum collections around the world. For the past 10 years he has worked as a research coordinator for the German Primate Center (DPZ). J�rg U. Ganzhorn is a Professor at the University of Hamburg's Department of Animal Ecology and Conservation. He has served as Chairman for the Madagascar section of the IUCN/SSC Primate Specialist Group since 1998. A zoologist by training, he has over 20 years experience conducting fieldwork in Madagascar. He has published widely on the vertebrate fauna of Madagascar and lemur ecology. Serge Rajaobelina is the President of Fanamby, a Malagasy non-governmental environmental organization that he founded in 1997. In the mid-1980s he served as Assistant Program Officer for the World Wildlife Fund-US Madagascar Program. He then moved to Conservation International, first as Program Officer (1989-1994) and then as Director (1995-1996) of its Madagascar program. Serge has returned to Madagascar Where, in addition to running Fanamby, he works in ecotourism development and biodiversity conservation. Ian Tattersall is a Curator in the Division of Anthropology of the American Museum of Natural History in New York City. A primatologist and paleontologist who has specialized in the study of lemurs since 1968, he has a central interest in systematics and has studied numerous aspects of lemur biology. He has carried out extensive fieldwork in Madagascar and the Comores, and is co-editor of Lemur Biology (1975) and author of The Primates of Madagascar (1982), as well as of numerous scientific papers. David Meyers received his Ph.D. in Physical Anthropology from Duke University in 1993 based upon a comparative ecological study of the newly-discovered golden-crowned sifaka. Meyers has done extensive research in Madagascar's eastern and northern forests, has worked for various conservation and development organizations including WWF, CI, WCS, UNDP, and the World Bank as well as for various private sector companies. He received his MBA from the Yale School of Management in 1999 and is currently developing an environmental business in Madagascar transforming rapidly-growing bamboo into high quality wood products. A native of Great Britain and a graduate of the Natural History Illustration Department of the Royal College of Art in London, Stephen Nash has been Scientific Illustrator for Conservation International since 1989, producing images for conservation education and biological publications. Prior to this, Nash was part of the World Wildlife Fund-US Primate Program. Based at the State University of New York at Stony Brook, he is a Visiting Research Associate in the Department of Anatomical Sciences and an Adjunct Associate Professor in the Department of Art.